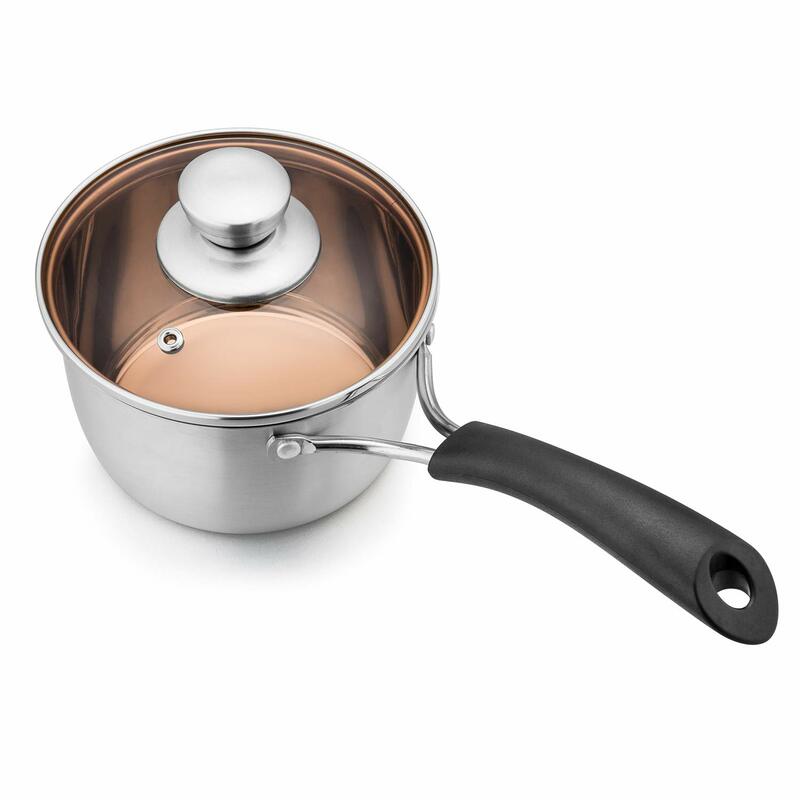 PREMIUM MATERIAL: TeamFar 14cm saucepan is constructed of 18/10 stainless steel, Rust-free and non-toxic, No worry about reacting with food or altering natural flavors, Providing consistent and healthy cooking results. ERGONOMIC HANDLE: Long handle is firmly riveted provides you with a secure, solid and comfortable grip, Bakelite designed is heat-proof and stays cool on the stovetop, A big hole at the handle end to hang up for easy storage. EXQUISITE CRAFT: Hollow lid knob ensures heat-proof and rimless edge helps pour liquid drip-free, Close-fitting cover locks in moisture and nutrient, Steam hole on the lid to avoid boiling over, Glass designed make viewing clearly. TeamFar Stainless Steel 14cm Saucepan with Lid, is made out of 304 pure stainless steel, which is healthy and durable for your daily cooking use. Glass lid is convenient for you to monitor the cooking food, and lock in the flavor and nutrient of food, Hollow knob is tightly riveted and stay cool for safely lifting up. This small metal pan is sufficient for individually cooking or small servings, Enjoy a green and healthy life with this metal versatile saucepan and get rid of chemical coatings! MULTI-USE – 1qt capacity great for small portion cooking use, such as eggs, tomato, pasta, and sauce, etc. 1.Please wash the saucepan with warm soapy water before your first using. 2.Please clean the saucepan with soft dishcloth, DO NOT use iron wire to scratch the shiny surface. 3.Please clean and dry the saucepan after using for healthy daily use, Dishwasher safe. Thank you for taking TeamFar as part of your family. We guarantee that all the description and specification are 100% to the reality of product. We’re working harder to offer more good items. We are Team, we go far, we are TeamFar. KEEP CLEAN: Solid and thick bottom make this steel sauce pan compatible with gas, electric ranges, ceramic and halogen stovetops, High grade polished makes easy clean and dishwasher safe, Not oven safe. MULTI-PURPOSE: 14cm/1L, Perfect size suitable for small portions: cooking vegetables, warming milk, melting butter, boiling eggs, simmering sauces or soups, blanching tomatoes or pastas, or simply reheating leftovers.